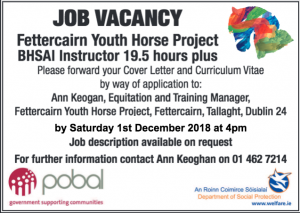 The Horse Project is a community based equine facility in Tallaght. We offer recreational, educational and development opportunities to young people. We are seeking a dynamic and enthusiastic person with the required skills and qualifications necessary to help manage the educational and training activities of the Project. Some evening and weekend work may be required. If you would like further information or the job description, please contact the Project Manager Ann Keogan at 01-4627214. FYHP is an equal opportunities employer. We welcome suitably qualified applicants from all sections of society. This entry was posted in General, Training by Dara Larkin. Bookmark the permalink.